Catch 22 Productions - Because new bands don't have fans. 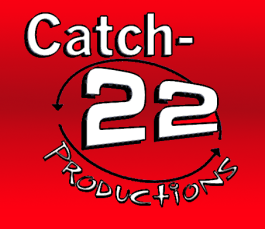 To join Catch 22 Productions fill out the form below. It is set up so everyone can use the same form, so just skip the parts that don't apply to you or your organization. Do you want to be an advertising sponsor of a show? Please provide preferred contact info below. Want to add a comment? Please use this box. We are currently seeking sponsors to help us realize our goals. If you know someone that might like to become a sponsor or if you would like to become a sponsor please contact us. Would you like to make a donation? Use PayPal.com it's painless. Send any amount to donations@c22p.org we will send you a tax deductible donation reciept. Or click the button for a secure link to our PayPal donation page. We are offering to hang a 2ft X 3ft banner with your information at each of our shows through the summer 2011 call for details.